Aneesa – Page 2 – tlc. | tender love and cupcakes. This is not a Valentine’s Day post. There will be no red velvet here today. No chocolate, even. No flowers, no candy hearts, and nothing fluffy and pink. This is not because I hate Valentine’s Day, or love. It’s because I think these winter months are neglected. I think we do ourselves a right injustice with the things we bake in January and February. Whatever the reasoning, I think it is silly. Why do we relegate warming spices to the months of October through December? Why do we leave our cans of pumpkin and bottles of allspice in the late fall? Y’all, anyone who’s lived in a place with seasons knows that the real cold comes in the depths of January and February, right after the last of the warm embers left over from Christmas lights and cozy evenings with family have burned out inside of us. And while I can appreciate a good red velvet, chocolate cake with more red dye than you care to know just doesn’t sing the same notes as cinnamon, cardamom, or earthy herbs. Let’s be real: this time of year is when we need that comfort food, in the form of hearty soups, lots of steaming potatoes, and warm, dense spice cakes. 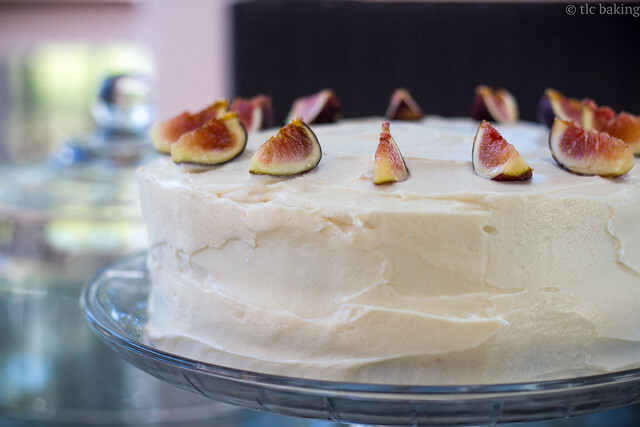 So maybe this is a Valentine’s Day post after all, insofar as I want to express my undying love for spice cakes and cream cheese frosting. 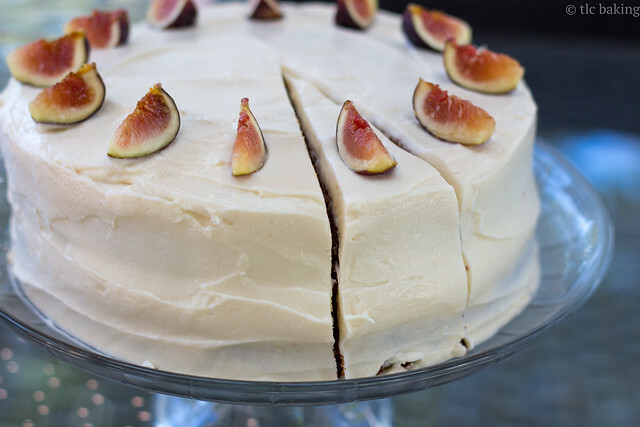 This one in particular comes courtesy of the New York Times, made dense with olive oil and fig jam, pleasantly studded with bits of fresh figs, and topped with a tangy-sweet cream cheese-and-honey combination–and more fresh figs, of course. 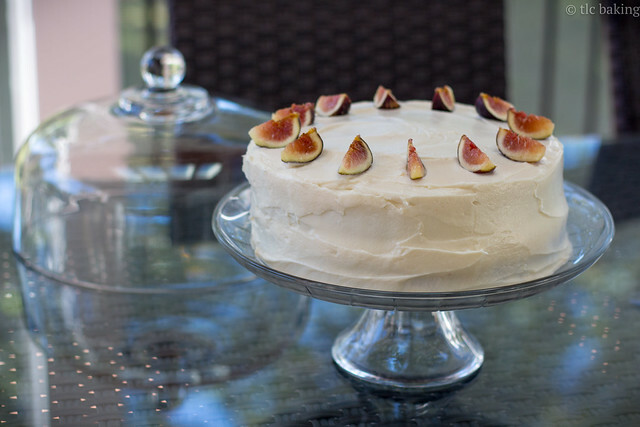 I know this isn’t quite the time for figs, so if you can’t find them at your usual grocery store, feel free to skip them and add a touch more jam instead. Maybe experiment with different fruits. Apricots? Pears? Surely, you can’t go wrong here. 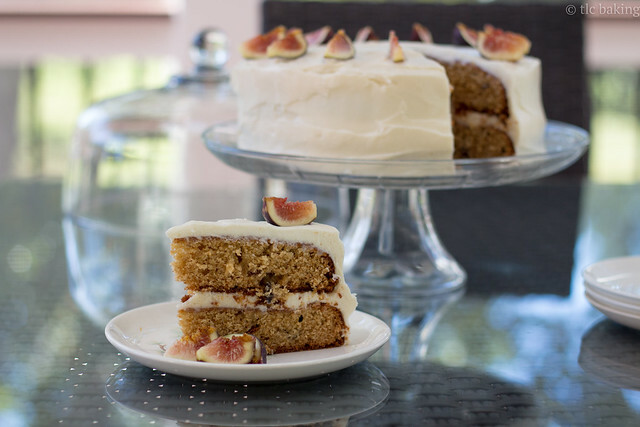 Do keep an eye on the cake, especially if you’re using two 9″ pans like I did. 35 minutes left them under-baked, but 10 more minutes dried them out a touch. 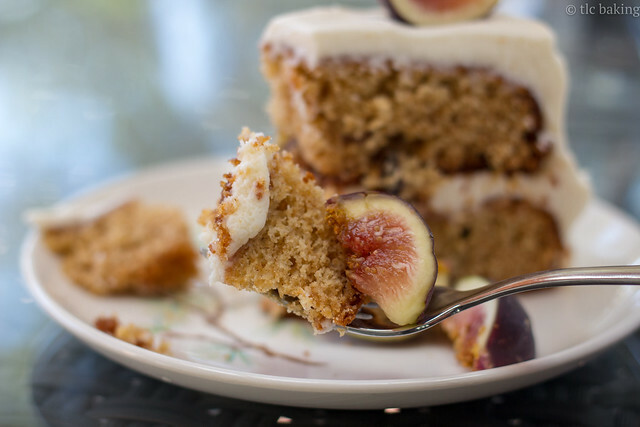 Of course, if you do over-bake, don’t worry–leaving the cake out for a day allows the moisture from the frosting to sink into the cake, bringing back that nice, tender crumb. Just make sure you pop it in the fridge soon after to prevent the fruit from spoiling. I said earlier that I don’t hate Valentine’s Day. While this is technically true, I don’t like it, either. I spent my evening doing homework, munching on leftover baked tofu, watching a bit of the Olympics. (Who else saw Shaun White last night?! What an absolute legend.) But if you are less of a grump than I am, I hope you got to revel in the cutout hearts and cupids and saccharine sap of today. Just make sure you enjoy an extra chocolate-covered strawberry for me. One of these days, I will start posting seasonally appropriate recipes in their appropriate seasons. You see, recently, I realized with some embarrassment that I had never made a whole cheesecake. 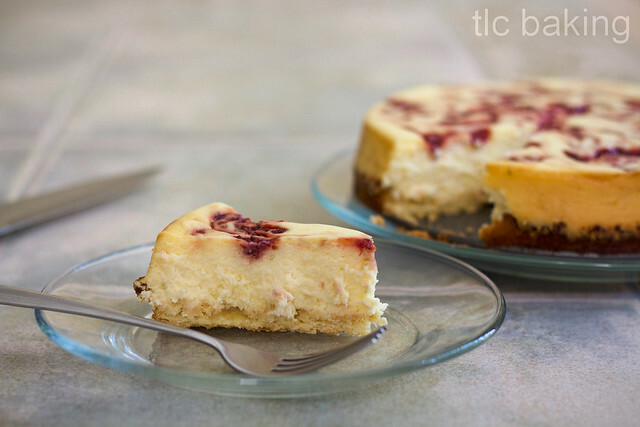 Cheesecake bars, yes, and mini cheesecakes, and an abundance of cream cheese frostings and fillings, and one time even a pumpkin cheesecake pie situation–but never a whole, pure cheesecake, edges lightly browned and inviting coming out of a springform pan. So, I did it. I made a cheesecake. And not just any cheesecake. This was a strawberry key lime cheesecake, which wriggled into my head as a vague idea when thinking of tacos one day and nested there until I had to pay attention to it. (The boyfriend’s fondness for cheesecake perhaps played a role in this idea actually coming to fruition, too.) 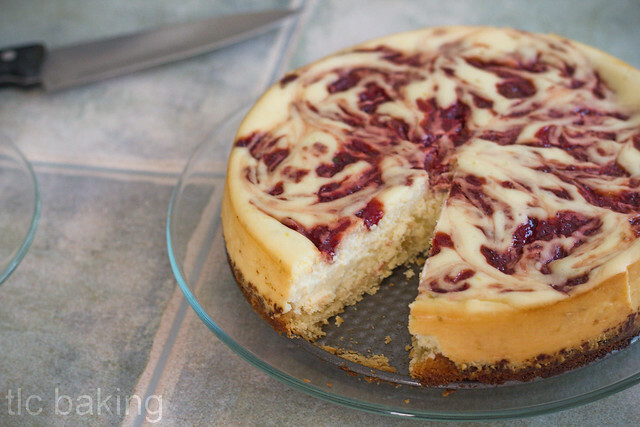 It’s a mixture of this mini cheesecake kitchme recipe and this crust from Joy of Baking with a generous amount of finger-crossing and hand-waving in the process. I went with the shortbread crust because graham crackers are nice and all, but if you had the option to eat a cookie with your cheesecake, you’d be a fool to choose anything else, right? Especially if that cookie was the stuff of buttery, crumbly perfection? The lighter flavor of the shortbread really allows the key lime taste to take center stage. I was a bit too light-handed when stirring in the strawberry compote (which is also on the tart side, so as not to turn the dish sickly sweet), and the strawberries got a bit lost in the richness of the cheesecake. Luckily, an entire pound of strawberries leaves plenty of leftovers. 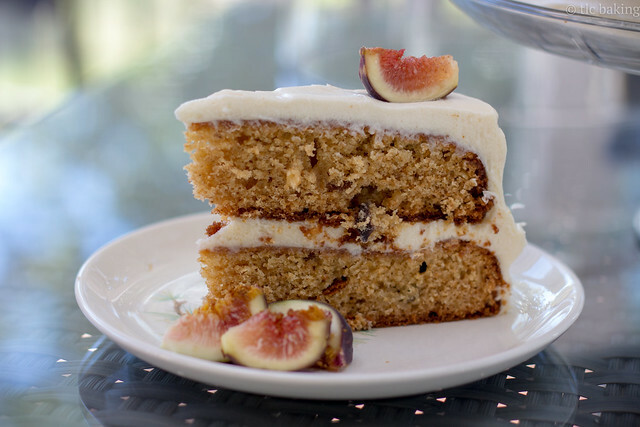 A generous spoonful over each slice balanced all parts perfectly. I think the only downside of this is that I now know how delicious homemade, fresh-fruit cheesecake is. This could be dangerous. And while it is technically already fall, I’m sure I’m not the only one who wore shorts today (it’s in the 80s in Boston!). Perhaps some of you will take this recipe as a way to seize these last few bits of summer that seem too reluctant to leave us just yet. Hull and chop the strawberries. Add the strawberries and sugar (to taste) to a saucepan over low-medium heat, along with a couple teaspoons of water to get the compote started. Stir the strawberries frequently over the heat until the mixture is goopy and there are no more distinct chunks of fruit in the saucepan. Remove from heat and let cool. The compote will continue to thicken as it cools, so don't worry if it still feels a little more runny than you want. Preheat your oven to 425F. Grease and flour an 8" springform pan. Whisk together the flour, salt, sugar, and lime zest. Cut the cold butter into the dry ingredients with a pastry cutter or a couple of forks, working until you can pull the dough together in clumps. With your fingers, press the dough into the bottom of the springform pan, bringing it just slightly up the edges of the pan. Use a fork to pierce rows of holes into the pressed dough to keep it from shrinking in the oven. Bake crust for 11-13 minutes, until the edges are golden brown. Remove from oven and let cool completely. Beat the softened cream cheese and sugar until completely smooth. Stir in lime zest, lime juice, and vanilla extract. Pour mixture over the cooled crust. 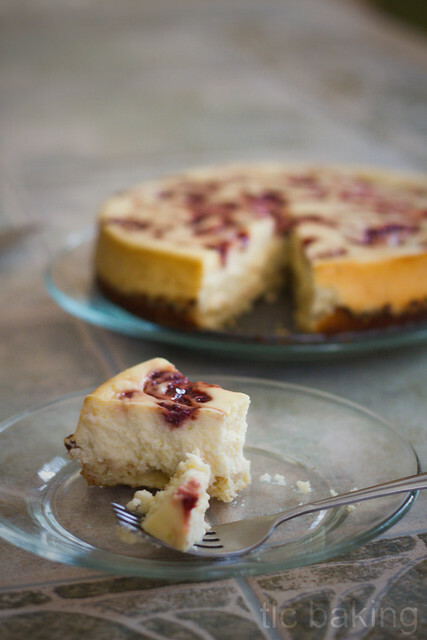 Carefully dollop strawberry compote over the cheesecake filling. Add as little or as much as you want. 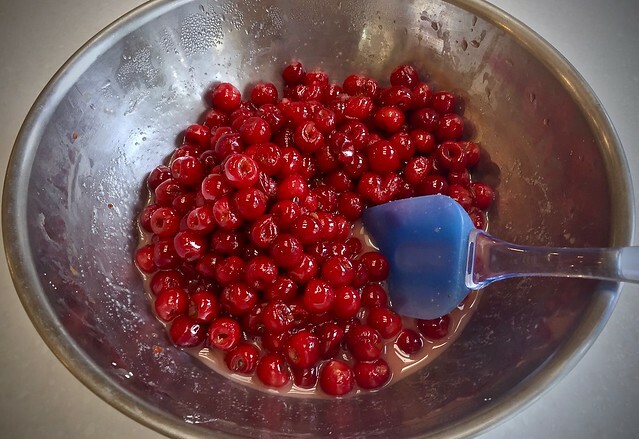 Use the tip of a knife to swirl the compote into the top of the filling. 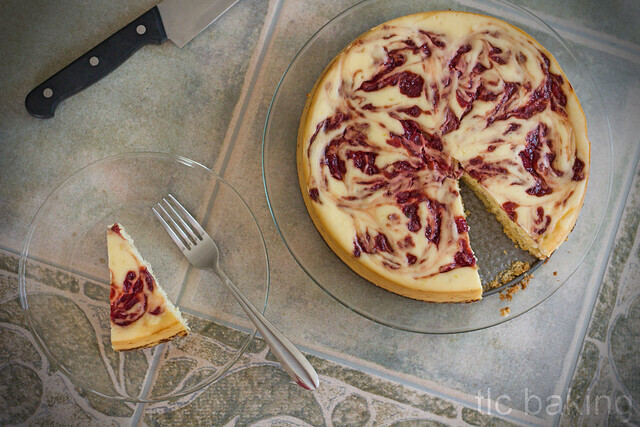 Bake the cheesecake for 15 minutes, then reduce the temperature to 250F and let bake for 55 minutes. Gently shake the pan. If the center of the cheesecake still jiggles, put it back in the oven for 10 more minutes. Repeat until the center of the cheesecake is just set. Mine took ~75 minutes at 250F to set, but this can vary a lot depending on your oven, so just keep checking. 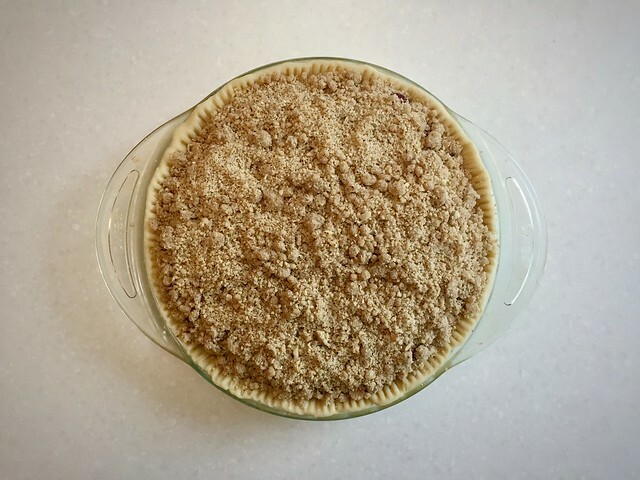 I skipped the zest in the shortbread crust--not because I did not want it, but because I am more forgetful in a kitchen than I would like to admit. The cheesecake was not lacking, but an extra kick of key lime would've been an excellent addition. At some point, I think I’m going to have to rename this blog Attempts to Recreate Every Smittenkitchen Recipe Ever, because Deb is just 100% my go-to for desserts–especially fruit-based ones. 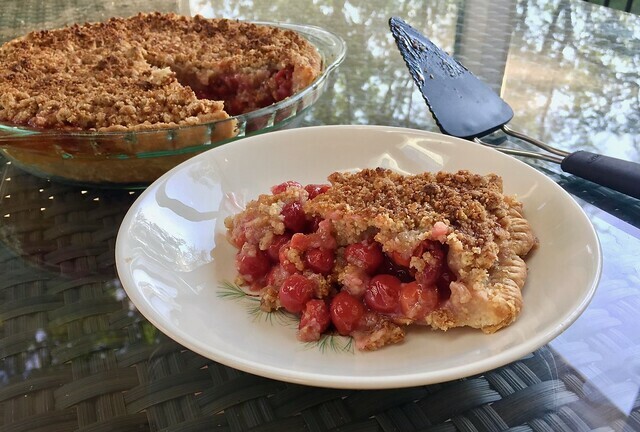 I made her strawberry graham ice box cake for a Memorial Day cookout (post coming at some point), and when I found myself with 4+ pounds of freshly-picked tart cherries on my hands a few weeks ago, I knew I had to jump on this sour cherry pie with almond crumble. Seriously, Deb, have you ever made a fruit dessert that isn’t incredible? This is everything a cherry pie is supposed to be. 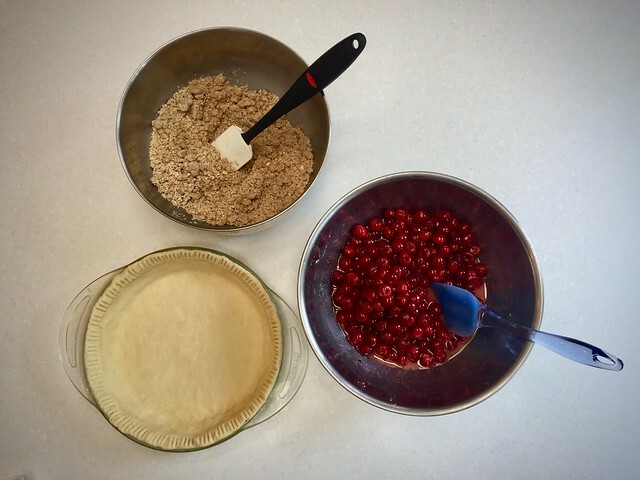 Ever-reliable, ever-flaky, buttery pie crust holds up more than 2 full pounds of tart, juicy, bright red cherries, each one a bursting nugget of sour-sweet joy. Top it all off with a nutty, warm crumble, and you have an absolutely irresistible slice of pure summer. Pair it with a scoop of vanilla ice cream while it’s piping hot, or eat it the next morning right out of the fridge with a cup of coffee. This pie does not disappoint at any temperature. And really, the cherries are the star of this show. 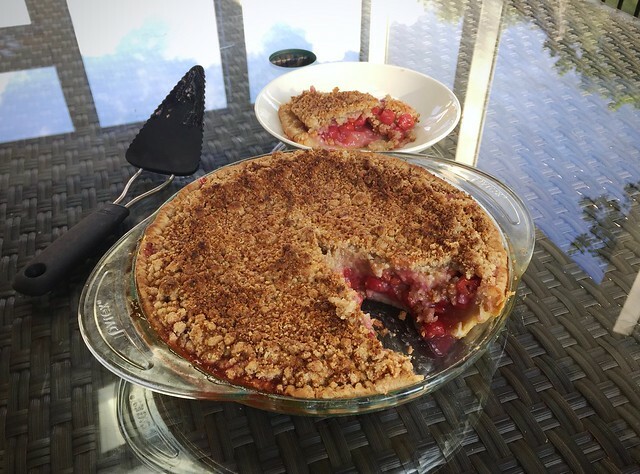 While I’m pretty sure I could eat that crumble by the spoonful, the almond-oat crunch and melt-in-your-mouth dough are just the supporting actors in a tart cherry extravaganza. And when I say “supporting”, I really should clarify: buttery and nutty goodness aside, there are not many doughs in the world that could physically support this weight of pure summer fruit. This crust, alas, is not among that short list, and it is quite difficult to plate a clean slice. But hey, who’s mad about a few spilled cherries? Tart cherry season is still going strong in most parts, so get yourself a pint or three while the getting’s good and heed the calls of this plate of summer’s joy. To anyone else currently listening to the last bits of a nearby fireworks display, or wishing that your neighbors’ kids would stop popping firecrackers in the parking lot after 10 pm, or perhaps even (carefully) lighting a few of your own: Happy Fourth of July! I hope you all celebrated with the appropriate company of good food, good friends, and ample pie. Here’s to another year of doing our parts to make our country the best it can be.